← Georgiaing: The Narrative Has Begun. You May Notice We Didn’t Talk About Jeremy Pruitt Today. Only because we know nothing. Except for everything. And yo, if the altercation involved Schotty, Pruitt should get a raise. Pruitt left Florida State for physical ‘altercations’ involving women, so we should’ve seen this coming. 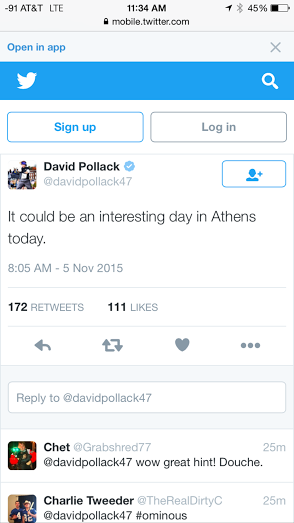 The first @ reply to David Pollack’s crypticness is gold. Finally, Dude Emeritus Andrew Hall broke the truth. The DudeYouCrazy braintrust was going to add its text conversation about the matter, because our #sources are all over this. Will amend when Chris Broussard gets back to us. 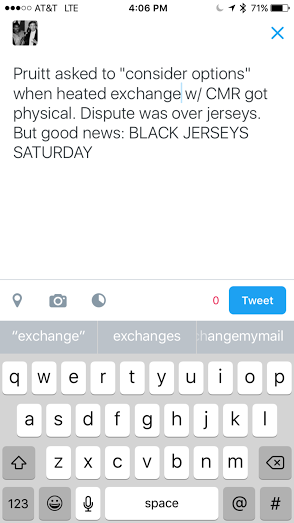 Posted on November 5, 2015, in Blog. Bookmark the permalink. Leave a comment.